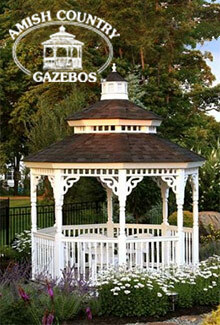 Transform your garden and outdoor living spaces with custom Amish gazebos and gazebo kits. Finest Quality - Beautify your backyard with a wide selection of custom-built wood or vinyl gazebos that are exclusively handmade by a masterful team of Amish craftsmen. Add style, shade and serenity to your outdoor living areas with durably constructed Amish gazebos that will serve as the perfect centerpiece for your garden, lawn, patio or poolside. View the Amish Country Gazebos online catalog or order your own free ACG catalog, DVD and price guide that will include all of the information you need along with an extensive assortment of garden gazebos and styles that will complement any landscape and cater to any budget. Design Your Own Gazebo - Whether you prefer screened in garden gazebos to keep insects away, a traditional gazebo to cover your spa, or a majestic look to serve as a backdrop for special outdoor events, they'll make it easy to create and construct the ultimate gazebo of your dreams. Launch their easy-to-use Design Your Own Gazebo feature online to select your preferred size, material, roof style, shingles, and more details and accents that will make your gazebo all your own. The ACG Difference - What makes an ACG gazebo different from those produced by other manufacturers? All ACG Amish gazebos are hand-built and engineered by actual Amish craftsmen and backed by a lifetime guarantee, so you know that your gazebo is built with care and built to last. The best building materials, the best service, the best quality and the best value. Photo Gallery - If you've always wanted a custom gazebo but don't know where to start, browse ACG's online picture gallery for endless ideas and inspiration. Explore a sampling of wood and vinyl options in various styles, shapes and sizes that will enhance any landscape design. ACG is the nation's leading retailer of quality garden and patio gazebos and DIY kits, featuring ready made and Design Your Own options that will help you add beauty and tranquility to your home.